The Acura ILX Hybrid is a gasoline-electric version of Acura’s entry level luxury four-door sedan. It is Acura’s first hybrid vehicle, even though Acura’s parent company, Honda, has invested heavily in hybrid technology and has produced several different hybrid vehicles. The concept versions of the traditional gasoline Acura ILX and the ILX Hybrid were previewed at the North American International Auto Show in Detroit in January of 2012, and the production versions were introduced a month later at the Chicago Auto Show. 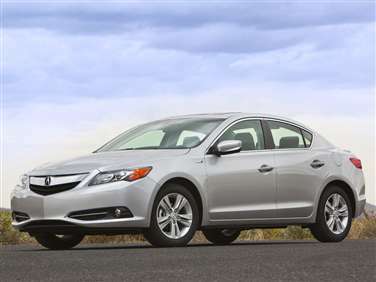 The ILX Hybrid went into production that April and went on sale in the United States that May. The Acura ILX lineup is manufactured in a Honda assembly plant in Greensburg, Indiana, in the United States. This Acura model is not available in Japan. The Acura ILX Hybrid is a front-engine, front-wheel-drive vehicle based on the 2012 Honda Civic Hybrid sedan. It is constructed of high strength steel and aluminum. The Acura ILX features upgraded suspension and steering components over the Honda Civic, to provide better handling and a more comfortable ride. The interior and features are also upgraded on the Acura ILX Hybrid as compared to its Honda sibling, owing to the two different price points the vehicles occupy, and a sleeker exterior design helps illustrate the difference. The cabin of the Acura ILX Hybrid is constructed of higher quality materials, and for the 2014 model year the ILX Hybrid comes equipped standard with leather upholstery, heated front seats with an eight-way power adjustable driver’s seat, an upgraded audio system with a subwoofer and Active Noise Cancellation, a steering wheel trimmed in thick leather, USB and iPod integration, Bluetooth wireless integration, a five-inch color information display, dual zone automatic climate control, keyless entry and push button ignition, and 17-inch alloy wheels. Other features are grouped into different option packages. Such equipment includes a navigation system with an available upgrade to a voice controlled system, a premium audio system with integrated satellite and internet radio, real time traffic and weather information, automatic HID or xenon headlamps, a multi-view rear camera with side angle and top down functions, a sunroof, Zagat destination reviews integrated into the navigation system, GPS-linked climate control, a voice-activated audio system that recognizes vocal song commands, and digital music storage. Standard safety features on the Acura ILX Hybrid include a six-airbag system with two front airbags, two side airbags, and two side curtain airbags, vehicle stability assist, a tire pressure monitoring system, and a security system. The hybrid drivetrain in the Acura ILX is shared with the Honda Civic Hybrid. It is composed of a 1.5-liter four-cylinder gasoline engine and a permanent magnet electric motor for a combined total 111 horsepower, paired to a lithium-ion battery pack. The drivetrain uses a continuously variable automatic transmission that’s been tuned to provide better response than the unit found in the Civic Hybrid, and is operated with paddle shifters. The Environmental Protection Agency has rated the Acura ILX Hybrid at 39 miles per gallon city, 38 miles per gallon highway, and 38 miles per gallon combined.